Information on knife laws, including those of a number of cities, can be found on Knife Rights’ LegalBlade App. However, because there are hundreds, if not thousands, of local knife regulations, it is impossible to list them all. 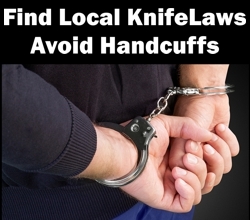 In most cases, if you want to know local knife restrictions and bans, you will need to either locate the regulations online or contact the jurisdiction. Note that 10 states have enacted Knife Rights’ signature Knife Law Preemption statute which nullifies any local knife regulations more restrictive than state law. Knife Rights passed the nation’s first Knife Law Preemption bill in Arizona in 2010 and has since passed preemption bills in Alaska, Georgia, Kansas, New Hampshire, Oklahoma, Tennessee, Texas, Utah and Wisconsin. In these states, once you know the state law from the Knife Rights’ LegalBlade App, you know the law throughout that state. Or, use a search site like Google and search for “Municipal Code” or “Criminal Code” and the name of the municipality or jurisdiction. Another option is the local library which often carries the town municipal code. Speak to the research librarian, who is generally very helpful. In our experience law enforcement personnel are generally not a reliable source for accurate information on knife laws. You would want to inquire at the office of the District Attorney or equivalent, for the jurisdiction. Ask them to provide the actual language of the prohibition or restriction, as even they may be misinformed. The above information is not legal advice and should not be relied upon as legal advice. Knife Rights cannot provide legal advice. You should consult an attorney for legal advice.